In this three-hour hands-on training course, expert Raju Gandhi walks you through building a full application using Vue. You'll start with the basics before moving on to writing custom components, using Vuex for state management, and using the Vue router to enable routing within your application. You'll leave with the experience you need to get quickly started on your next project in Vue or dive into an existing code base. You’re a developer looking to use Vue in an existing or new project, whether in just one part of your application or a full-blown single-page application (SPA). You're a technical lead attempting to assess if Vue is the right framework for your team. You work with other frameworks like React and Angular and want to learn how Vue is different and what it offers. 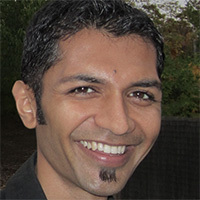 Raju Gandhi is a programmer, consultant, speaker, trainer, and all-around nice guy. He has worked in the software industry for over 15 years and has experience in both government and private sectors. Raju is a practitioner of both Agile and DevOps methods as well as good programming and architectural patterns and believes that finding the right balance between such practices will allow us to deliver software that our customers cherish. He is also a strong advocate of functional programming and a proponent of immutability across both software and hardware. Raju is a regular speaker at conferences around the country (and occasionally around the world) and has routinely participated in the No Fluff, Just Stuff tour. In his spare time, you will find Raju reading, playing with technology, or spending time with his wonderful (and significantly better) other half.